NASA's Orion spacecraft is just four weeks away from setting sail on its maiden voyage. The capsule is all buttoned for flight inside the Launch Abort System Facility at Kennedy Space Center. On Monday evening, Orion will roll over to Space Launch Complex 37, where it will meet up with its ride to orbit, a Delta IV Heavy rocket. Launch day is Dec. 4. Exploration Flight Test 1, or EFT-1, is a milestone 11 years in the making. Orion was originally introduced as the Crew Exploration Vehicle in Jan. 2004, in the wake of the space shuttle Columbia disaster. The new spacecraft was, and still is, the cornerstone of NASA's plans to explore deep space. December's test flight is the culmination of a decade of uncertainty for the agency's human exploration program. "EFT-1 is absolutely the biggest thing that this agency is going to do this year," said William Hill, deputy associate administrator for NASA's Exploration Systems Development, at a Thursday press conference. "I may be partial because it's in my area," he added. Orion sits in the Launch Abort System Facility at Kennedy Space Center after receiving its Launch Abort System and Ogive panels. The Ogive dampens the acoustic load on the crew module, and reduces drag. EFT-1 is a shakedown cruise. It's purpose is to give Orion's critical systems a thorough checkout. This includes the capsule's heat shield, which must be able to withstand the high temperatures it will encounter when returning from missions beyond Earth orbit. EFT-1 is a two-orbit, four-and-a-half hour flight that will send Orion to an altitude of 5,800 kilometers (3,600 miles)—about 15 times higher than the International Space Station. 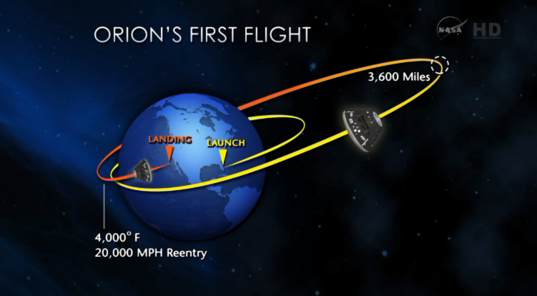 Mike Sarafin, Orion's flight director, said the Earth will resemble a six-foot disc held at arm's length. Cameras inside the spacecraft will be positioned to look out the window, capturing the scene, along with other engineering data. It will be the highest a human exploration spacecraft has been since Apollo 17 in 1972. 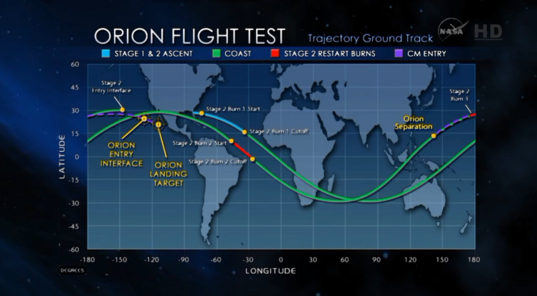 The unusual trajectory will send Orion back into the atmosphere at 32,000 kilometers (20,000 miles) per hour—about 84 percent of lunar reentry velocity. The heat shield will reach 2,200 degrees Celsius (4,000 degrees Fahrenheit). It's an ablative heat shield, designed to burn off as the capsule hurtles back toward Earth. Orion Program Manager Mark Geyer said about 20 percent of the shield will shed during reentry. His team will take extensive measurements after the flight to see how well the shield performed. There will also be temperature sensors aboard the spacecraft, including a radiometer and piece of ruby that will take readings of the vehicle's searing plasma trail—the first time such a direct measurement has been attempted, Geyer said. Additionally, an armada of boats, airplanes and helicopters will be waiting for Orion when it splashes down off Baja California in the Pacific Ocean. "There's a P-3 [aircraft] that we're using that will actually thermal-image the heatshield and give us some temperature data," Geyer said. The fleet will also help monitor the health of Orion's parachutes. There are 17 separation events throughout the mission, which include jettisoning things like the Launch Abort System, Service Module, and forward bay cover, which protects the parachutes. All of these events must work right on the first try. 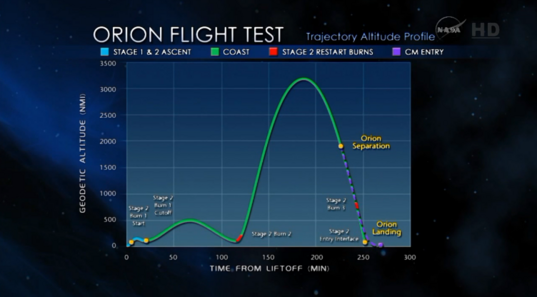 EFT-1 will be the first time these systems have all been tested in sequence, in an actual flight environment. Furthermore, Orion's high altitude will subject the spacecraft to higher levels of radiation than crews face in low-Earth orbit, providing important data on how well the capsule performs in this harsh region of space. After splashdown, Orion will be towed into the flooded well deck of a U.S. Navy LPD (Landing Platform/Dock) amphibious assault ship. Because this is a test flight with no crew aboard, NASA and the Navy intend to work very methodically to test out their recovery techniques. Normally, splashdown will occur off the coast of San Diego, but for December's test flight, the landing will take place about 100 miles west of the tip of Baja California. Orion's Dec. 4 launch day begins at 1:05 a.m. EST (6:05 UTC), six hours before launch. The Delta IV Heavy's Mobile Service Tower will be retracted, leaving Orion and its rocket sitting on the Launch Table next to the Fixed Umbilical Tower. The rocket will be fueled, and Orion will be powered on. The two-hour, 40-minute launch window opens at 7:05 a.m. EST (12:05 UTC). The time was chosen for optimal lighting conditions at the launch site and in the Pacific Ocean, where Orion will splash down four hours and 20 minutes later. Because of the short mission duration, Orion's go/no-go criteria depends on weather conditions at both the launch and recovery sites. If the Dec. 4 launch is scrubbed, retry attempts are already booked for Dec. 5 and 6. Posted below is a partial timeline of events for EFT-1, compiled from information given at press conferences, estimates taken from mission profile charts, and NASA's Orion Blog. I find it to be a touch ironic that the first test flight of Orion (which is attempting to rebuild a capability we abandoned 40 years ago for the Space Shuttle) is using the same launch complex (SLC-37) that was used a half a century ago for the first Apollo orbital test flights. I find it sad that this may be, like the Ares launch a few years ago, the only mission of it's kind. With the large luddite faction in congress, the whole thing might be scrapped. BTW, someone should put a version of this article on Wikipedia. 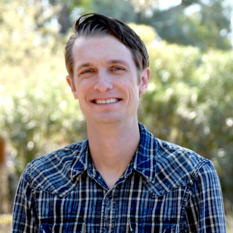 This is a nice brief article Jason. Thanks. The one point NASA is doing I don't care for is the extrapolation for the heat shield test. They really should have gone a bit higher and come back at Lunar re-entry speeds. it is about time that this country get back to creating a reliable and safe way to get heavy loads and people to orbit. Shuttle was a relic of the 70s that had everyone on pins and needles every time one launched. Congress should be ashamed,Ed of itself for not leading the way on this and getting us back to launch capability much sooner. The president should be ashamed for canceling plans for constellation which delayed everything that much more. But then again, the current president and congress are not leaders. They are dissembling everything we stand for, including our role in space exploration.